So having shared my angst with you, I'll proceed to babble about some other things in progress. After returning to Taos a week ago, I decided it was time to purge more of my mess; this time starting with knitting books. 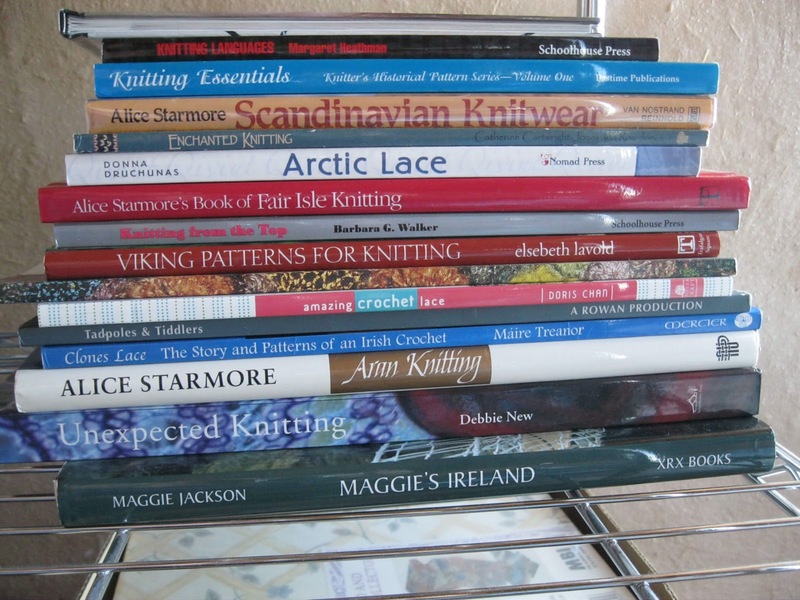 When I had the yarn shop, just about every book we ordered came home with me (she said, greedily). 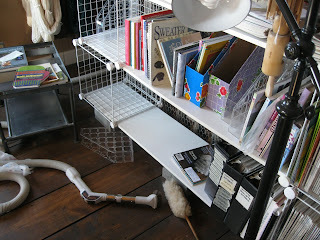 Now that my knitting projects are mostly for donation, and simple patterns, I've decided to clear the shelves. This week I listed over 20 books on Amazon, sold two promptly, and then this morning, checked my listings page: all but about 3 of my listings have been plowed under by newer listings, in some cases cutting my asking price in more than half (it's the economy, stupid). Books that were considered collectible a couple of years ago, and sold for big bucks, are now being dumped for next to nothing (ditto). I am starting to think that I'd be better off re-shelving the most precious and donating the rest to the library. My primary concern is that these books end up in the hands of someone who will love them. What to do??? Well, back to the shelves. If you look carefully, you'll see the tiny face of my enemy lying in wait on the floor...alongside my other enemy, the duster. Wish me luck. And you are right - it is scary what is happening because people haven't yet realized that we are in this together. I get the most scared when I see and hear attacks on poor people, as if they are the problem. Oh my...what have we created? You're so right, Robyn. Oprah has always said that many of us are only a few paychecks away from being homeless, and now it is coming to pass...it's like America has been on one big drunken spending spree for so many years, no one knows how to act sober. thanks for leaving a comment on my blog. You might want to enable your email if you want to hear back from people. Edit my profile, check mark in front of Show my Email address, and scroll down and SAVE.